Lucas Christopher Duda was born on February 3rd, 1986 in Fontana, California in San Bernardino County, approx. 50 miles outside of Los Angeles. Duda grew up an Anaheim Angels fan watching Wally Joyner & Darin Erstad play first base for the Halos. 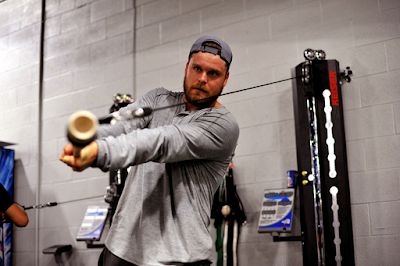 Duda was named All State in California in his high school senior year, batting .493. He then attended the University of Southern California playing three seasons with the Trojans batting .275 overall. He led the team in HRs (7) during his final season batting .280 as he moved over to play left field. 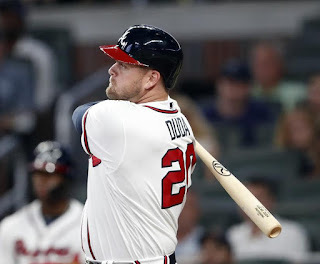 In 2007 the six foot three, left handed hitting, right hand throwing Duda was drafted in the seventh round (the 243rd pick overall) by the New York Mets. He is known as "the Dude" as well as "the Big Lebowski". Later in 2007 he was a member of the Brooklyn Cyclones who went all the way to the New York/Penn League finals losing to the Auburn Doubleday’s. Duda batted .299 with 4 HRs 20 doubles & 32 RBIs playing both left field & at first base throughout the season. The following year he was promoted to A ball St. Lucie where he batted .263 with 11 HRs while striking out 129 times. But his play was good enough to get him to AA Binghamton in 2009 where he hit .281 with 9 HRs 7 53 RBIs in 110 games, posting a .996 fielding % at first base. He began 2010 back at Binghamton but after 45 games was promoted to AAA Buffalo. He had a big year in Buffalo including setting a Bison’s record by homering in five straight games & winning their Player of the Year Award. He also won the 2010 Mets organization Sterling Award. Overall in 115 games in the minors in 2010, he hit .304 with 23 HRs with 40 doubles 87 RBIs &.398 on base percentage. He earned the September call up to the Mets making his debut on September 1st, flying from Buffalo to Atlanta. In that game he made a great sliding catch in the outfield & went hit less in three at bats. Two weeks later he hit his first career HR , also against Atlanta, off Braves pitcher Tommy Hanson whom he had played against in high school. Duda hit another HR in Florida & then two more on the final home stand at Citi Field against Milwaukee & Washington. He finished the year hitting safely in 11 of his last 16 games, batting .202 with 4 HRs 6 doubles 13 RBIs in 29 games played. In 2011 he made the club out of Spring Training and got an appearance as a pinch hitter on Opening Day going 0-1. He struggled with just two hits in 21 at bats through May 4th and was sent down to AAA Buffalo to get things together. In 38 games with the Bisons he hit 10 HRs with 24 RBIs while batting .302 getting back to New York by June 2nd. Upon his return he had an RBI single & RBI sac fly against the Pittsburgh Pirates helping Dillon Gee to his seventh straight win. He began to hit throughout the month, on June 25th at Arlington Texas in an interleague game with the Rangers he had four hits with three doubles & four RBIs in the Mets 14-5 win. Duda hit safely in nine of ten games in July, hitting a HR at Cincinnati on the 27th, while driving in runs in the next two games as well. In August he hit six HRs while driving in twenty runs, collecting seven multi hit games raising his average above .290. On August 8th he batted in the cleanup spot for the first time in his young career. Later he came to bat against Padres closer Heath Bell with the Mets down by one run with Justin Turner on third base & David Wright on second base. He singled home both runs for a dramatic walk off win, only the fourth of the year for the Mets. From August 8th through the 29th he hit safely in 14 of 18 games, with 26 hits driving in 16 runs. He began September driving in runs in six of his first seven games, including driving in the only run of a September 7th game in Florida helping R.A. Dickey to 1-0 win over Brad Hand. In twenty games on the month he drove in eleven runs finishing out the season batting .292 with 10 HRs 21 doubles 50 RBIs & a .370 on base % in 100 games played. 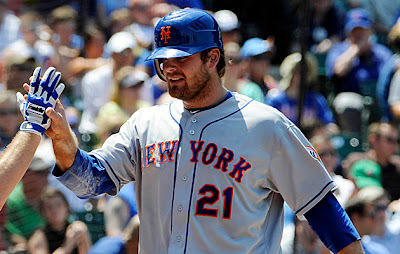 Duda began 2012 batting sixth & playing right field in the Opening Day win against the Atlanta Braves. The nest day he hit two solo HRs, leading the team to a 4-2 win. On April 24th he broke an 8th inning, 1-1 tie in Miami with an RBI base hit off Edward Mujica, which turned out to be the game winning hit. From April 24th to the 28th, he drove in eight runs, topped off with a four RBI game on April 28th where he hit his fourth HR. On May 22nd his 8th inning RBI broke another tie game & led to a 3-1 win over the Pirates in Pittsburgh. On May 30th he had another multi HR game, in a 10-6 loss to the Philadelphia Phillies. He began June with a big four RBI game against the St. Louis Cardinals. He bashed a three run HR & helped Johan Santana in the 8-0 shut out. Later in the week, he hit a two run HR off Chien-Ming Wang in Washington, leading to a 3-1 Mets win. At this early point in the season the Mets were surprising everyone by competing with the Nationals for the top spot in the East. In July he fell into a deep slump & was batting .241, although he did have 12 HRs. He was sent down to AAA Buffalo where he batted .260, with three HRs & eight RBIs through August 25th. On August 29th he hit a two run HR off the Phillies Matt Harvey in the second inning, it turned out to be the winning runs in the Mets 3-2 win. 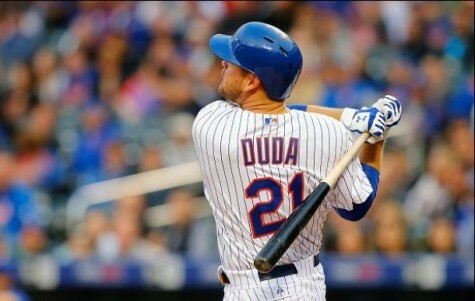 In September Duda, hit just two HRs & finished the year batting .239. His highlight that month, was hitting a three run HR off the Braves Tim Hudson, driving in all three Mets runs in Jonathon Niese's 3-1 win. 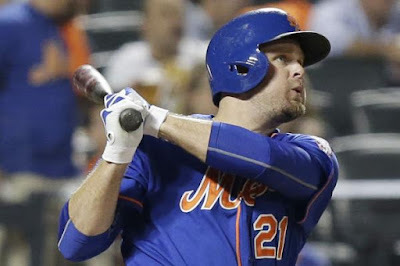 Duda finished the year at .239 with 15 HRs 15 doubles 57 RBIs & a .329 on base %. In the outfield (105 games) he made five assists making four errors with a .977 fielding %. In the off season he suffered a broken right wrist while moving furniture in Southern California, he had surgery & was ready by Spring Training. Entering the 2013 season his role was not certain, but the fact he was one of the clubs biggest HR threats was in his favor. He began the year with a HR in the second game of the season & then hit a pair on April 10th in Philadelphia in a 7-3 Mets win. On April 19th he had another multi HR game, hitting two against the Nats in a 7-1 at Citi Field. 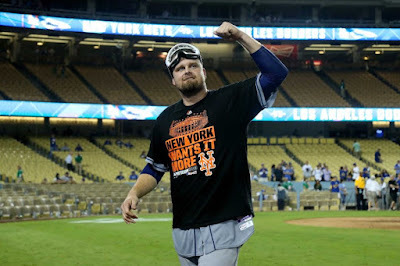 During the subway series sweep at the end of May, Duda contributed on May 28th, with a game winning walk off single off Mariano Rivera. The Mets had entered the bottom of the 9th down 1-0, but Daniel Murphy doubled & David Wright singled to tie the game. Duda's hit followed. The next day he had a two run double in the Mets 9-4 win across town in the Bronx. 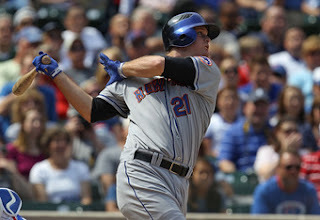 By June 22nd he had 11 HRs, tied for second on the club with David Wright & one behind leader; John Buck. But Duda was batting just .235 & then he went down with a strained muscle in his ribs, he would miss two months of action. 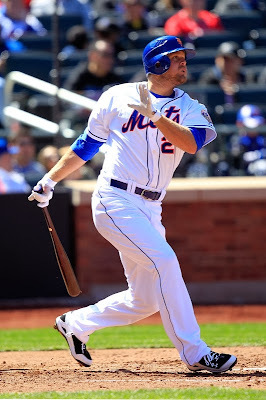 He had seen the majority of his playing time in left field (58 games) before the injury but when he returned he was mostly at first base (34 games) after the struggles of Ike Davis. He shared time there with Josh Satin. In September he hit four HRs with 10 RBIs & 15 walks, as he continued to hit for low average but put up good on base %. On September 13th, he carried the Mets to a 4-3 win over the Miami Marlins at Citi Field with his 6th inning, three run HR off Brad Hand. He finished the year with 15 HRs, 16 doubles, 33 RBIs, 55 walks & a .352 on base % (second on the club to David Wright) in 100 games. He struck out 102 times, his second straight year of 100 or more Ks. Although the Mets did make minor attempts to shop Duda in the off season, they eventually traded away Ike Davis early in 2014 season. Duda was their man & the Mets regular first baseman. 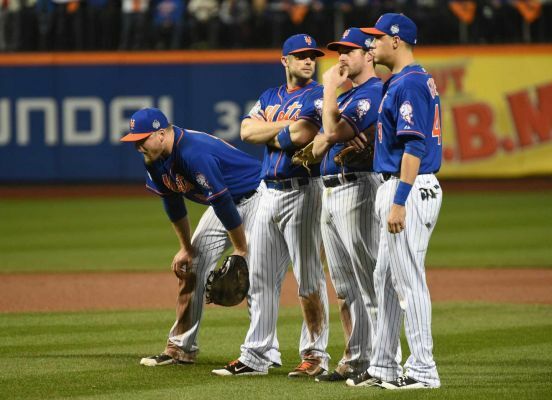 On April 4th, Mets manager Terry Collins announced that Duda would get the bulk of the playing time at first base. 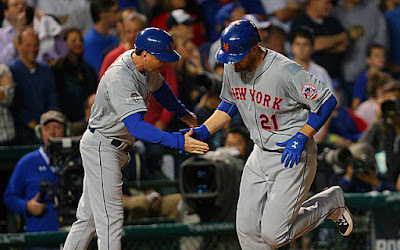 That night, Duda responded &hit a pair of HRs, driving in all four runs of the Mets 4-3 win over the Cincinnati Reds. He had a slow start to the season, hitting four HRs in April & three in May, finishing the month batting .236. He started off June with a top of the 11th inning game winning HR, at Philadelphia off Phillipe Aumont. He capped off an eight game hit streak & then drove in six runs in the week. In the final two weeks of June he hit four HRs & raised his average to .255. On the 4th of July, he helped the Mets in 6-5 win against the Texas Rangers, adding a two run HR off Yu Darvish. 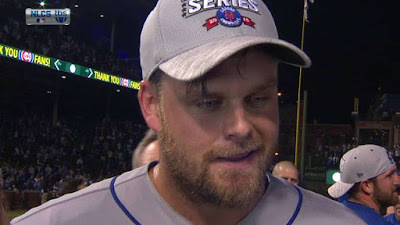 In the final eight games of the month of July he played in, Duda hit five HRs, three coming in a four game series at Milwaukee, with the Mets winning two of those games. As the Mets returned home, Dud hit a three run HR in an 11-2 romp over the Philadelphia Phillies. He added another on August 1st, in a 5-1 loss to the San Francisco Giants. It was the first time in his career he passed the 20 HR mark in a season. Duda had driven in runs in seven straight games, eight of nine. Over a six game stretch in mid August he went on another hot streak, hitting five HRs driving in 11 runs. On August 24th, at Dodger Stadium the Mets avoided a sweep exploding for 11 runs in an 11-3 win over the Dodgers. Duda hit two HRs & drove in five runs, while collecting three hits helping Bartolo Colon to his 12th win. In September he capped off the year by driving in 16 runs in the month, while hitting four HRs. The most important ones came on September 27th & 28th, the last games of the year. On the 27th, the Mets were down 1-0 to the Houston Astros in the bottom of the 9th inning with one on & two out. Duda blasted a two run walk off HR down the right field line, off Tony Sipp for an exciting game winner. 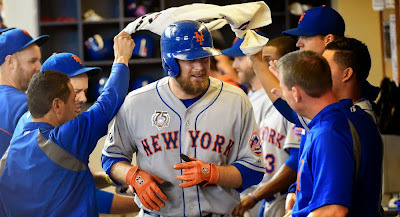 The next day, he hit an 8th inning HR adding to the Mets lead & personally giving him his 30th HR of the year. It was a milestone mark, as Duda enjoyed the best year of his young career. He led the Mets with 30 HRs (3rd best in the NL), 92 RBIs (5th best in the NL) 8 intentional walks (10th in the NL) a .481 slugging% & a .349 on base %. At first base in 146 games, he posted a .994 fielding % & was second in the league helping turn 125 double plays. 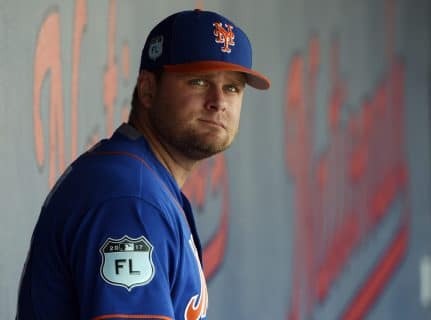 Trivia: Due to his name Duda, some opposing teams will have the public address announcer play Camptown Races when he comes to bat- doo da doo da! 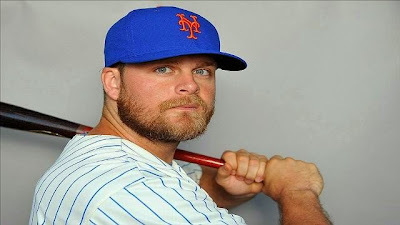 Lucas Duda started out 2015 expected to be the Mets main slugger, on Opening Day in Washington D.C. with the Mets down 1-0 after a Brian Harper HR, Duda put the Mets ahead with a two run single scoring David Wright & Curtis Granderson. The Mets went on to a 3-1 win. 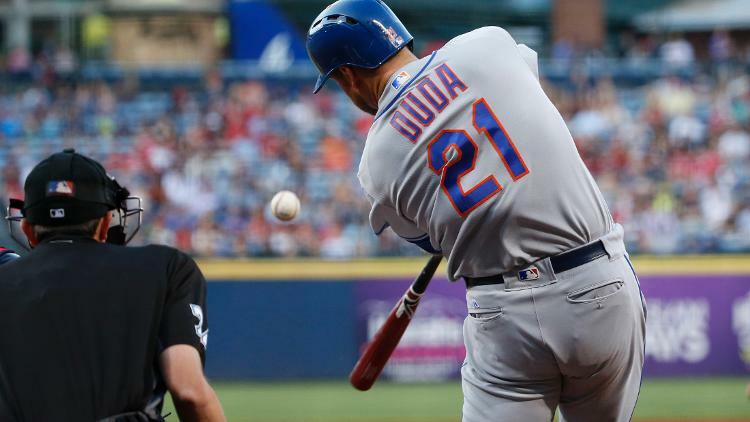 A week later, as the Mets put together an 11 game win streak, Duda had a good home stand, driving in seven runs with a dozen hits, including six doubles in that stretch. On April 14th he hit a pair of doubles driving in three runs, helping Matt Harvey to his second win, as the Mets beat the Phillies 6-5. The next day he hit his first HR of the season, with another double driving in two more runs, as the Mets beat the Phils 6-1. 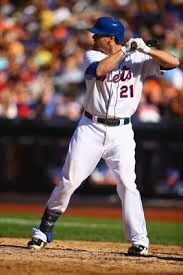 On April 22nd, his 8th inning single against the Braves broke a 2-2 tie & was the Mets game winning hit. He added a HR during the early season subway series & finished the month of April batting .325. 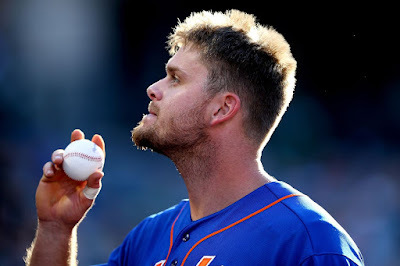 On May 25th, Duda hit two HRs & drove in four runs, as Jacob deGrom (& Jeurys Familia) shut out the St. Louis Cardinals 5-0. Five days later he had another multi HR game, as Duda hit two solo HRs helping the Mets in a 7-0 win over Philadelphia. He closed out May still batting at .300 (.298). In June he slumped off hitting just one HR & seeing his average drop forty points. But he did drive in nine runs with four of them coming in one run games & helping in Mets wins. 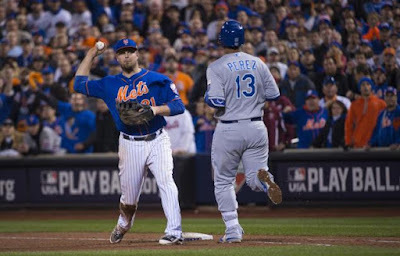 On June 15th, with the Mets down 3-2 in the bottom of the 11th inning, Duda tied the game with a base hit off the Jays Brett Cecil. He would score the winning run when Wilmer Flores singled up the middle, for a dramatic Mets come back. On June 27th, in another extra inning game, Duda won the game with a walk off RBI on a fielders choice scoring Dilson Herrera as the Mets beat the Cincinnati Reds 2-1. On July 10th, Duda hit a three run HR, leading the Mets & Noah Syndergaard to a 4-2 win over the Arizona d-Backs. The next day he hit a solo HR his 12th of the year, as the Mets went on to another 4-1 win over Arizona. At the end of July, Duda went on one of his hot streaks, tearing up the ball. 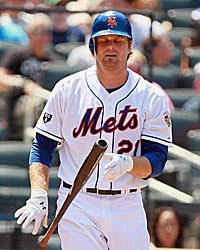 On July 25th, he helped the Mets beat up on the Dodgers at Citi Field, as he hit two solo HRs in New York's 15-2 victory. 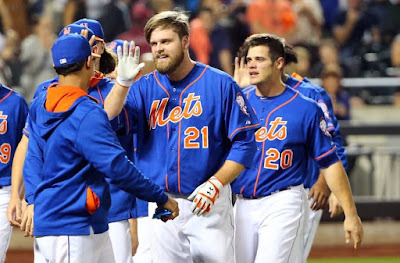 On July 28th, Duda hit a two run HR in another Noah Syndergaard win, this one in a 4-0 shut out over the San Diego Padres at Citi Field. Duda hit six HRs & drove in seven runs over the four game span. It was at this point the Mets were still in second place & struggling a bit. But that week the new additions of Yoenis Cespedes, Kelly Johnson & Juan Uribe helped bolster the Mets line up. Those bats along with rookie Michael Conforto, certainly supported Duda in the Mets now deeper line up. As the Mets forged ahead, they swept the first place Nationals in a huge series at Citi Field. 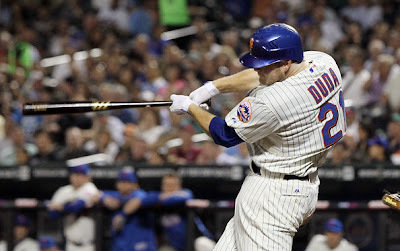 On August 1st, Duda set a Mets franchise record as he hit eight consecutive hits all coming as HRs. That day he hit two HRs off the Nats Joe Ross, driving in all three Mets runs as they went on to the 3-2 win behind Jacob deGrom & the Mets bullpen. The next day the Mets tied for first as Duda capped off a Mets five run, 3rd inning with a HR off Jordan Zimmermann, his 21st of the season. In the week from July 25th to August 2nd, he hit 9 HRs with 12 RBIs & 12 hits. He won the Player of the Week Award sharing it with team mate; Noah Syndergaard. Duda would spend some time on the DL that month & was able to rest since the Mets line up was scoring a lot of runs, especially off the bat of Yoenis Cespedes. 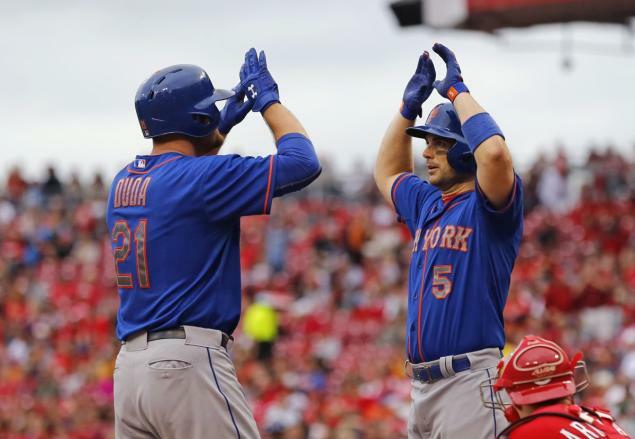 In September Duda had another monster series in Cincinnati the weekend the Mets clinched the NL Eastern Title. 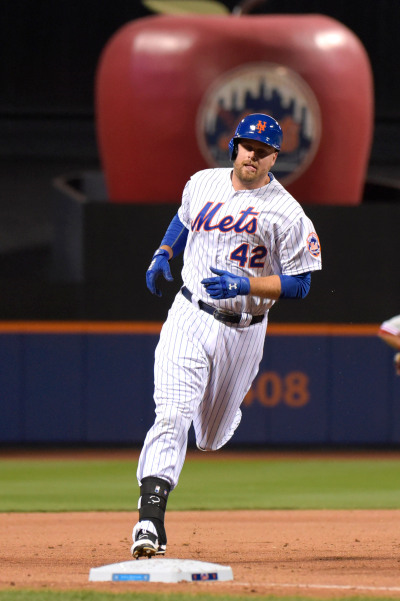 On September 23rd, he hit a pair of doubles off Matt Para, driving in two runs in the Mets 6-4 win. The next day on September 25th, the Mets clinched thief first NL Eastern title since 2006 & Lucas Duda had a career day for himself as well. He started out the game with his first ever career grand slam, it came in the 3rd inning off the Reds Anthony DeSclafani. He added another two run HR in the 7th inning, as he topped off the Mets 12-5 NL East clinching win. Once again Duda was on another of his amazing hot streaks. The next day he hit another HR & drove in four more runs. In his next game on September 29th, in Philadelphia he hit two more HRs getting him to 27 on the year. That day he drove in three more runs, totaling 73 for the year. In that four game stretch he would hit five HRs & drive in 15 runs. In the last game of the regular season, Duda was hit by a pitch by the Nats Tanner Roark. That gave Duda a total of 14 hit by pitches on the year (5th most in the NL) setting the Mets single season record previously held by John Olerud & Ron Hunt. 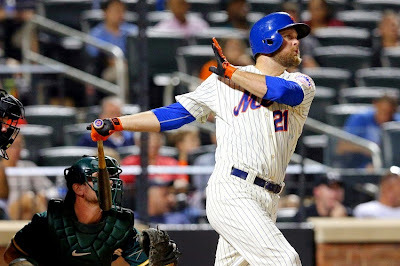 On the regular season Duda led the club in HRs (27) 10th most in the NL & tied for the RBI lead (73) with Daniel Murphy. He was second to Curtis Granderson in both doubles (33) & on base % (.352). During the year he had seven multi HR games. Duda drew 66 walks & struck out 138 times, the second year in a row he struck out over 130 times. 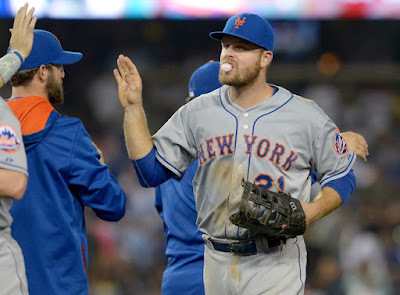 2015 Post Season: Duda struggeled in the NLDS against the Los Angeles Dodgers, going just 2-18 & striking out a record 11 times. 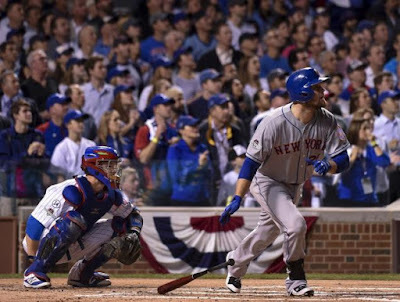 2015 NLCS: In the NLCS Mets sweep over the Chicago Cubs, he fared much better, mostly because of a hige last game. Duda went 4-10 batting .400 with a pair of doubles, a walk & a HR in the series. In the Game #4 sweep at Wrigley Field in Chicago, over the Cubs Duda started out the game with a three run in the 1st inning. Curtis Granderson started out the game with a single & then Yoenis Cespedes drew a two out walk leading to the Duda blast off Jason Hammel. Travis d'Arnaud followed with a solo HR putting the Mets up 4-0. In the 2nd inning, with David Wright & Daniel Murphy aboard, Duda doubled driving in two more runs. 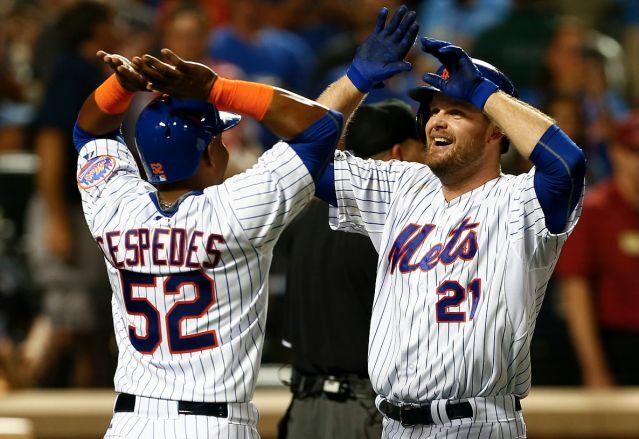 Duda's five RBI night tied a Mets record His five RBI was tied for the most by a Mets player in a single postseason game, a feat previously accomplished by Curtis Granderson in the 2015 NLDS, Carlos Delgado in the 2006 NLCS, Edgardo Alfonzo in the 1999 NLDS & Rusty Staub in the 1973 World Series. 2015 World Series: Dudas bat stayed a bit hot in the World Series, as he hit safely in the first three games. In Game #2 in Kansas City, Duda drove in the Mets sole run with a 4th inning single off Johnny Cueto. In Game #5 at Citi Field, the Mets held a 2-0 lead going to the 9th inning. Matt Harvey had pitched a shut out up to that point & Terry Collins allowed him to go out for the 9th as Harvey refused to be relieved. Unfortunately, it was the wrong move as Lorenzo Cain drew a walk, stole second & scored on Eric Hosmer's double. Mike Moustakas then grounded out to Duda at first base for the first out. Next up Salvatore Perez grounded to third. Duda took the throw for the out, then threw home as Hosmer broke for he plate. Dudas eratic throw allowed the tying run to score. 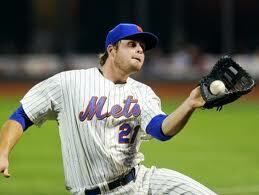 During the year Duda had only made three errors in 129 games at first base posting a .996 fielding %. Eventually the Mets lost the game in extra innings & their dream season was over. In January 2016, Duda avoided arbitration as the Mets gave him a $4.4 million dollar rase, as he will make $6.7 million in 2016. Duda began the year with high expectations as the Mets slugging first baseman. Unfortunately on May 23rd he went down with a stress fracture in his lower back, he would not return until September playing in just 47 games all season. On a mid April road trip to Philadelphia he hit HRs in three straight games, driving in five runs. 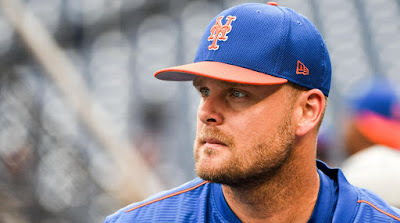 From April 17th to April 25th he drove in 11 runs, a typical Lucas Duda hot streak. 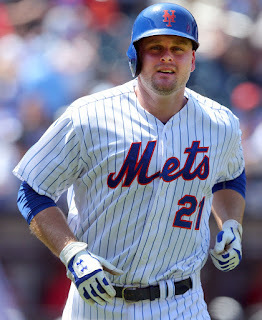 Another big day was May 4th where he hit two HRs in the Mets 8-0 win over the Atlanta Braves. When he returned in late September the Mets were in the middle of the wild card race which they eventually won & James Loney was their first baseman filling in for Duda in his absence. Duda made six starts in September after returning, having his best day on September 27th, collecting two hits & three RBIs. For 2016 he hit seven HRs with seven doubles 23 RBIs, a .302 on base % while batting .227. The Mets showed no plans to trade or replace Lucas Duda at first base before the 2017 season. They believed his back was fully healed & he could be a dominant force in their hitting attack. Things didn't work out that way. 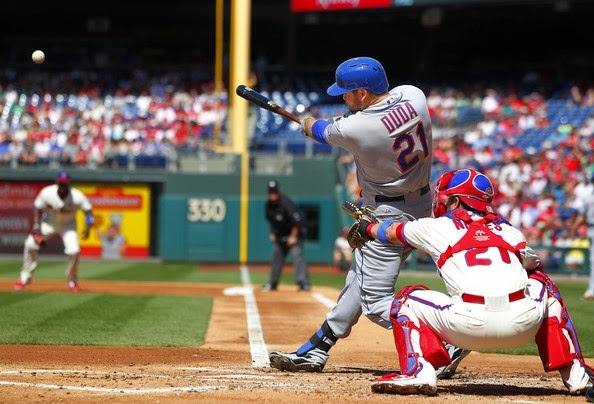 Duda had three RBI's in the Mets 6-0 Opening Day win over the Atlanta Braves. 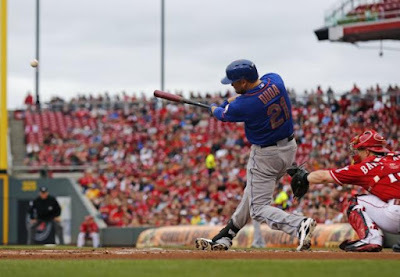 On April 11th he hit two HRs in the Mets 14-4 romp over the Phillies in Philadelphia. On April 19th, he went down with back issues returning a month later. In the weeks of May 25th to June 3rd he hit six HRs with 11 RBIs. He hit HRs in five games in a nine game span. On June 2nd he had another two HR game, and had four multi hit games in five game span. 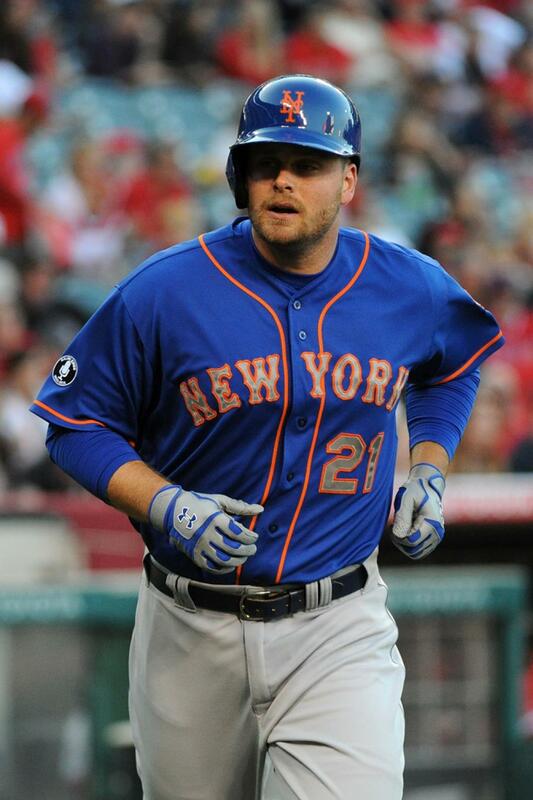 In July, Duda hit four HRs & saw his batting average fall to .246. On July 28th he was traded to the Tampa Rays for reliever Drew Smith. The Mets gave up on him with no real proven first baseman on the club. 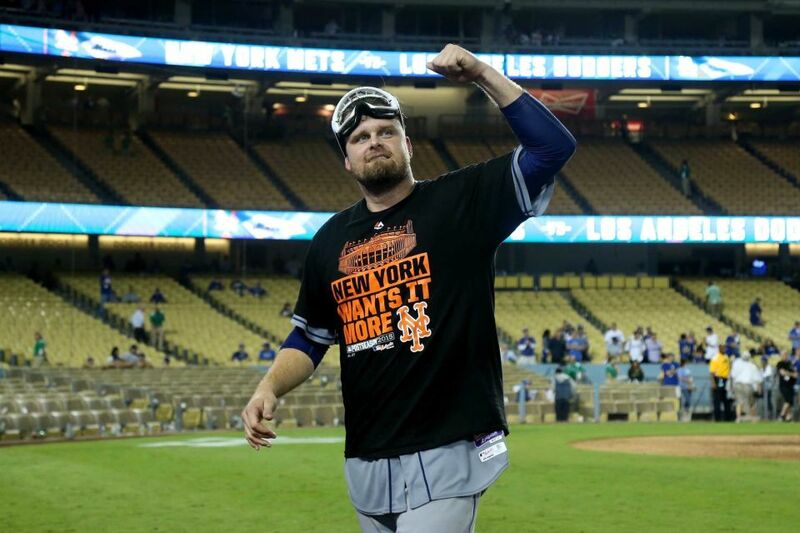 Duda will always be remembered for his contributions to the 2015 Pennant winner & his mammoth HRs. He finished out 2017 with the Tampa Rays batting just .175. But he did hit 17 HRs, giving him a total of 30 for the season. It was his second 30 HR season. He also drove in 27 runs in 52 games played. 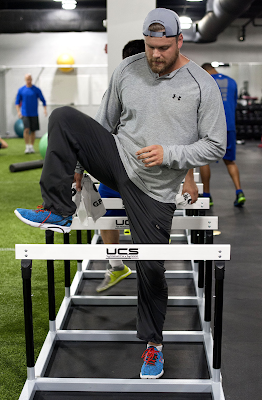 In February of 2018 he signed on with the Kansas City Royals. 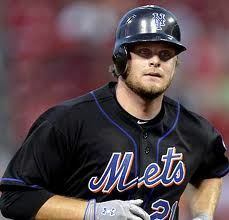 Duda hit 13 HRs with 12 doubles & 50 RBIs batting .242 in 87 games (310 at bats) seeing action in 61 games at first base. On August 29th his contract was purchased by the Atlanta Braves. In 20 games, just two at first base, he hit just one HR batting .222. In his nine year career Duda has played in 919 games with 723 hits, 152 HRs 167 doubles 455 RBIs 383 walks a .242 batting average & a .337 on base %. Duda has stuck out 847 times in 2993 at bats. In his career, Duda has averaged a HR in every 19.7 at bats, which is 128th best all time. He has played in 496 games at first base with a .995 fielding % making just 20 errors in 3868 chances. He has also played 234 games in the outfield making 7 errors with a .981 fielding %.